For more than two decades, we have been struggling with the conflicts that ethical vegans have faced within the Church. People who have a deep empathy for every living being upon this earth naturally seek to live more compassionately. They do everything in their power to end the suffering of every other living being, whether human or non-human. They stop eating animals. They stop wearing animal skins and using any product or services that exploit animals. They become vegans. In the process of making this lifestyle change, these vegans naturally think that the church will embrace their decision because it is the most loving, compassionate, and peacemaking way to live, and one that truly honors God and the whole of His creation. Unfortunately, in most cases the church has rejected this compassionate way of living in favor of exploiting God’s creation for their own personal lusts, and finding every excuse possible to justify their actions. The church has become indifferent to the suffering of animals and those who care about them; and, as a result, the vegans find themselves being ridiculed and generally made to feel uncomfortable. From our point of view, we believe that a church is to be a spiritual sanctuary where we can step away from the worldly problems of everyday living, and become filled with new spiritual energy to go forth and be the peacemaking children of God that the Lord has called us to be. If we feel called to be loving and compassionate to the whole of creation, when the world isn't, then we also need a quiet place that stimulates and encourages that calling. If the church doesn't do this, then we are left with the same conflicting and disturbing feelings we have in the world, which is the opposite of what a church should be. We can feel called to deliver our message of vegetarianism / veganism / animal rights in some venue, but it doesn't mean that we have to formally join that body to be effective, or just be a witness; we can belong elsewhere. This way, when our message of compassionate living is rejected, we can always go "home" for comfort and assurance. So, does the vegan remain in such a church or leave? This poses a dilemma that we really cannot answer for someone else, because we really don't know how the other person feels inside. We don't have to leave one place to check out another, and we don't have to make a formal change until we find that place of comfort. And, perhaps this is the reason why most of the vegan / animal rights people of faith we minister to are unchurched; because, unfortunately, what we are looking for is not very common in churches. 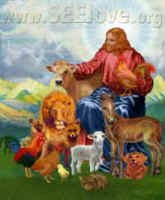 This is the main reason why we retired from formal church ministry in 1998: to concentrate full time on our world-wide internet ministry, www.all-creatures.org, so that we could more effectively offer our pastoral services and comfort to everyone, whether within or outside of a church setting. If the church would do what it is supposed to do, we would not have to be in this ministry. Until they change, we will continue to work to help the church become truly compassionate and accepting.